I have been married for eleven years. Let me rephrase that. We have been married for eleven years. If you ask me (and I know you didn’t), that’s awesome. Strangely, we still like each other. Our anniversary was last weekend. I was out of town. The Man wasn’t with me. I played in a tennis tournament in Rome. Georgia, not Italy. During a couple of my matches, I discussed with my opponents the fact that it was Mother’s Day weekend. We agreed that, although we were away from our children, playing tennis out of town was a great present. The reactions about being away for my anniversary were totally different. One man said, “you made your husband babysit on his anniversary?” Um, sir, no offense, but I don’t make my husband do anything. We don’t have a dictatorship. We’re partners. Last I checked, it wasn’t just his anniversary, either. Also, and I’ve said this a million times, he isn’t ever babysitting our children. It’s called parenting. A woman, who later told me she’d been married for twenty years, asked me how I broke the news to The Man. When I asked her what news needed to be broken, she told me how her husband would’ve been offended that she wanted to be away on their anniversary. Honestly, I’m pretty sure my husband was relieved. No pressure, right? We don’t do much for anniversaries anyway. Last year, for our tenth, we drank a nice bottle of wine and went out to dinner. We talked about our marriage and how much fun we have together. I’m not inclined to believe that the magnitude of the celebration directly parallels relationship quality. Similarly, the size of the diamond doesn’t prove anything. I rarely even wear my engagement ring. The Man never wears a wedding band. He has one. It is a sterling silver band. It cost me about $30, and that includes overnight shipping. I think he wore it for about a year. Bleach ruined the silver patina, so that was his excuse. He hasn’t worn it since. A wedding band is a very attractive accessory. It’s not a hill worth dying on, though. We’re pretty happy in spite of the lack of rings. It’s rough for The Man, because Mother’s Day is very close to our anniversary, and my birthday is ten days later. For Mother’s Day, I’d like to be completely off-duty. That’s my gift. Anything tangible should be handmade by our children. This year, The Girl gave me a metal washer necklace decorated with nail polish. I love it. For my birthday, I usually end up getting something I need. This year, that’s a tennis racquet. I should clarify, just in case he’s reading: I don’t need a vacuum, washing machine, dishwasher, or anything else related to cleaning house. Those are household purchases, not gifts. For our anniversary, we don’t typically do presents. One year, though, The Man splurged and planned on surprising me. It was the year of our fifth anniversary and my 30th birthday. On anniversary night, I cooked at home, and we drank the bottle of champagne my dad sent us. The Man didn’t say much about the five year milestone. Mother’s day passed with barely a mention. Because it was a big year, people started asking if he’d done anything. A friend delivered a monogrammed tray, because she wanted to be sure I opened a present that year. I wasn’t mad, by any means, but I was starting to wonder about the radio silence. It was unusual. The morning of my birthday, I woke up to a bright, shiny diamond anniversary band. I was shocked and overly excited. Later, as The Man told the story, his friends admitted to being nervous for him. They’d wondered why he hadn’t done anything for our anniversary or made plans for my birthday. As it turns out, he had a plan all along. He knew there was a gift coming, and it was a good gift, so he was good. The only suggestion the guys made was to give the gift on the first of three occasions, rather than the last, ten days later. Come out of the gates kickin’ and avoid any confusion. We didn’t do gifts this year. Heck, we weren’t even together. We do a lot of things together, but we don’t to everything together. We love time away from the kids as much as we like adventures with them. Apparently whatever we’re doing is working for us. My dad sent our yearly bottle of bubbly, and I’m sure we’ll go out to dinner at some point. We’re thinking about taking a kidless trip this summer. Either way, we made it another year. 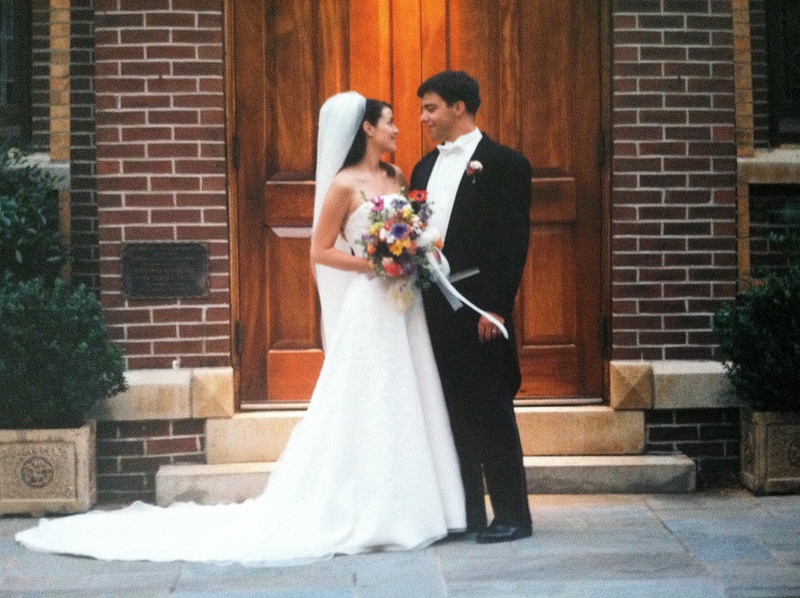 Eleven years ago, on our wedding day, I walked out of the bridal suite and cussed (the s word) when I saw Brice. We hadn’t gotten married yet. It was supposed to be bad luck. If this is the bad luck, I can’t wait to see the good stuff. Cheers! ← Believe it or not, some of us want downtown Augusta to make it. Congratulations. And as long as it works, there is not need to “fix” it.